The Social Network falls into one of my favourite genres: The nearly-present-just-recently-past historical drama - like Oliver Stone’s W. (about George W. Bush while he was still in office) or Stephen Frears’ The Queen (about The Queen). One of the good side effects of telling a story still so tied to the present is that it becomes less plausible to make the main protagonist a hero or a god with all the banal evidence still in plain view. But in any case, seeing the more life-size protagonists and daily banalities blown up as big as cinema screen is just as surreal as watching a bunch of gods portrayed in a realistic setting. We are not missing the “awe” factor. The Queen in The Queen is freakishly life-size while the story, both weirder and more familiar than normal, remains a healthy contender for a new kind of epicness. There’s always a bit of complaining when turning a section of life into a bio-pic. Primarily the complaints involve accusations that elements of the truth were sacrificed for the romance of the story, but it’s not just Hollywood that turns things into big stories – our brains do it all the time too, even with our own boring lives. Personal media framing websites like Facebook and Youtube help to speed this up. Luckily, most of us know better than to completely trust the history books or our own memories. Now we just have to learn how not to always trust our own eyes. The Social Network is framed by a typical boy-losses-girl-then-says-internally-I’ll-show-you!-then-becomes-important-though-never-forgets-the-girl kind of story. The boy is a Harvard undergrad, Mark Zuckerberg. He is the founder of Facebook. Most of the movie is set at Harvard. Harvard looks more excitingly foreboding than Hollywood here with all of its old-school and discreet power. The girl goes to a different university and we can’t quite remember her name. Because the movie is framed this way, the narrative tension and resolution rests on this simple arc and not on the other details of the complicated Facebook founding story. This is good news because it allows the Facebook story to be ever-complicated and truthfully unresolved while we still get the delicious full sandwich of a tidy story. The untidy part is up for interpretation. There are the Winkevosses - handsome, gentlemanly identical twin brothers. They are Harvard elites who are only a touch sinister. They seem to represent not only each other, but many of their kind that we can't see. They believe that they have gotten their idea of a Harvard-only networking site swiped from under their noses by Mark Zuckerberg. They probably have, but it's hard to worry about them too much. Some of us are not accustomed to this much privilege and it seems more wondrous and strange than what they think they got cheated out of. After Mark Zuckerberg gets Facebook up and running, we're happy for him when he becomes friends with Sean Parker (founder of Napster). We imagine that it feels great to find a colleague who is just as obsessed by the same kind of creation as he is. We imagine that they have a lot to talk about. In this movie, this is when Mark Zuckerberg looks happiest, though the creators seem to credit the excitement to cheap glamour more than creative interest. It is hard not to take pleasure here in a representation of the older generation's frequent blindness over Internet matters, as though the kids are talking about a pretend world that doesn't really matter. The freedom of not being seen feels thrilling here. And it’s hard to get too upset with Mark Zuckerberg when he royally and legally cheats his best friend/ business partner, the sweetheart Eduardo Saverin, out of his fair share of the business. We’re not sure if this was one more move on top of a series of fights between the two friends, or if it was just a callous business decision. 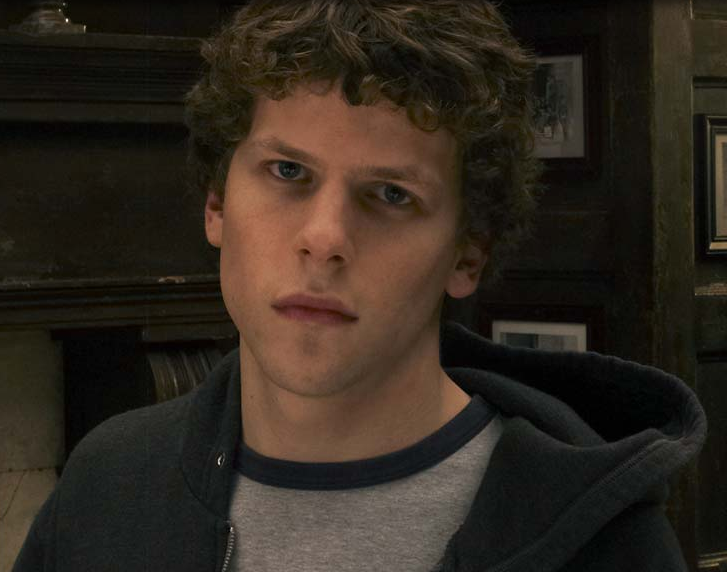 But we have known since the beginning of the movie that Mark Zuckerberg has always been a bit of a jerk, even when he was just a best friend that was a nobody. This last move should not have been too much of a surprise to Eduardo Saverin. We feel for anyone who has been unpleasantly suprised by a friend even when they shouldn't have been surprised (Eduardo Saverin and Mark Zuckerberg included). It happens to the best of us - especially when we are young and patient and become friends with people who might not be such a good fit. Nevertheless, we have some optimism that these two may re-friend each other some day (in the imagined post-movie movie-life of this particular movie).